The 2007 mercury mountaineer electric vehicle qualifies for a federal tax credit of up to $7,500, effectively reducing the net base price. Although Mercury's Mountaineer may look like a high-end premium SUV, it's actually a stylish version of the rugged Ford Explorer. Mercury's twist, which includes a heavy dose of its new trademark vertical-line styling and heavy chrome accents, dresses up the vehicle to near-Lincoln levels of luxury. 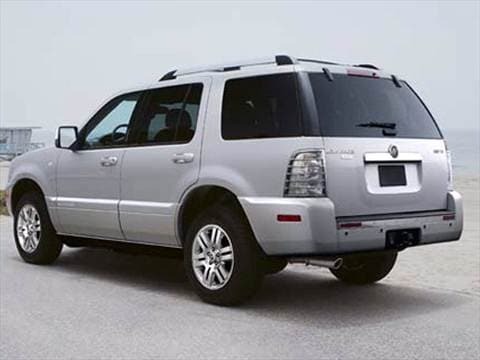 Best of all, the Mountaineer retains all the beneficial features of the Explorer, including seven-passenger seating, a rugged body-on-frame architecture and four-wheel-drive capability. Toss in the standard Safety Canopy side-curtain airbags and a long list of luxury and entertainment features, and the Mountaineer looks to be quite a bargain. If you like everything about the Ford Explorer, but you'd like to own a vehicle with a little more distinction, the Mercury version of the popular SUV is quite appealing. Those who need to tow a trailer will find the Mountaineer with the V6 engine to be underpowered. Compared to some newer midsize SUVs, the Mountaineer's interior can feel slightly narrow. The Mountaineer receives a few new standard features, including the Safety Canopy side-curtain airbag system, an audio input jack and some new colors. New options include a heated windshield and a larger, eight-inch screen on the rear-seat DVD player. On the road, the Mountaineer delivers on all points. Its independent rear suspension provides it with great stability while cornering, and the redesigned variable-rate power steering returns excellent feedback to the driver. The ride is as soft and controlled as any full-size sedan, and the Mountaineer's cockpit is amazingly quiet and rattle-free. Mercury has spent considerable time and money in an effort to reduce noise, vibration and harshness, and the payoff is evident. The Mountaineer also has an impressive array of safety features, with crumple zones in the front fenders, three-point seat belts at all positions and a side-curtain airbag system that deploys to cover seventy-five percent of the side glass area. The optional Reverse Sensing System alerts you to objects behind the vehicle that are out of the range of the rearview mirror. The Mountaineer's standard Safety Canopy airbag system protects passengers in the event of a rollover or side collision. The Mountaineer's interior is beautifully arranged with high-quality plastics and an intelligent dash design that features new audio and climate controls. The available power-adjustable pedals are most helpful in finding a comfortable driving position. Second-row passengers have good leg and headroom, but the third row is narrow and low to the floor, making long trips uncomfortable for adults. Oddly, the heated windshield cannot be ordered on vehicles equipped with navigation. The Mountaineer takes the rugged good looks of the Explorer and stamps Mercury's new styling theme on its sheet metal. Features such as the retractable running boards and the external keypad lock/unlocking system are unique in this segment and help bolster the Mountaineer's sophisticated image. Some may find the Mountaineer's tall step-in height and roof a bit of a challenge, especially when trying to access items secured to the roof rack. From the waterfall grille to the unique side cladding to the ribbed tail lamps, the Mountaineer places a different but attractive spin on a familiar platform. The entry-level Mountaineer provides a long list of standard equipment, including a V6 engine, dual-zone automatic air conditioning, SecuriLock passive anti-theft system, four-wheel anti-lock disc brakes (ABS), side-curtain airbags, rear defroster, power windows, power locks, dual-heated power mirrors, illuminated entry with remote and driver's door keypad, fog lights, automatic headlamps, AM/FM stereo with CD, 10-way power driver's seat, speed control, tire pressure monitor, 17-inch machined-aluminum wheels and a rear wiper/washer. Options include a 4.6-liter V8 engine, all-wheel drive, power-adjustable pedals, power glass moonroof, navigation, heated windshield, Reverse Sensing System, rear-seat DVD entertainment system, Audiophile sound system, heated leather seats, power-extendable running boards and an automatic garage door opener. Recent swings in gas prices might make the V6 Mountaineer an attractive prospect, but it has basically the same EPA figures as the V8. Acceleration and passing power are adequate with the V6, but you won't want to be towing a very big trailer with this engine. The V8 is the powerplant of choice. Its three-valve-per-cylinder design helps create lots of torque and it runs very smoothly, yet doesn't consume much more fuel than the V6. The two-wheel-drive Mountaineer with the V6 engine has a Manufacturer's Suggested Retail Price (MSRP) of $27,995, while the all-wheel-drive Premier starts at $33,335. The top-of-the-line Premier with the V8 and all-wheel-drive is $34,535 and, when loaded, can top out near $40,000. The Fair Purchase Price shows real-world transaction prices in your area, so be sure to check it out before you begin negotiating price. Kelley Blue Book expects the Mountaineer to hold only average resale values over a five-year period. All-wheel-drive models with the V8 are expected to retain a slightly higher resale than the V6, but all versions fall far below the values held by competitors from Toyota, Honda and Nissan. First 100,000 many repairs, second 92,000 virtually repair free. Still has good power, no oil usage, mpg 18/21. even though it is a gas hog I really enjoy this SUV. This is the best vehicle I have owned! Nice car - but not good gas mileage. Excellent stability, safety, and reliability. Loaded with options. Great in snow. First vehicle in over 27 years I wanted to keep.